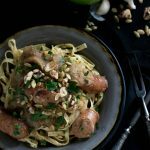 Instant Pot Apple Chicken Sausage - What the Forks for Dinner? Not a clue in the world as to what I would use it for….. I just had to buy it. Pasta begs for a red or white sauce….ho hum!! It’s fall….apple time. Wal Mart has a Sam’s Club chicken apple sausage that is to die for. 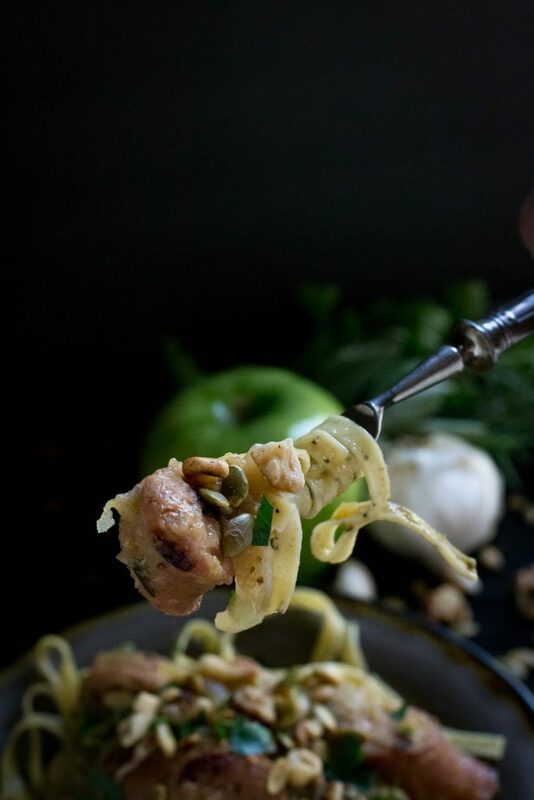 All natural chicken and sweet apples….soo good! Maybe a nice sausage onion …..I wasn’t ready to call it sauce yet, but it was a start. Here is where the ‘happy little accident’ comes in. 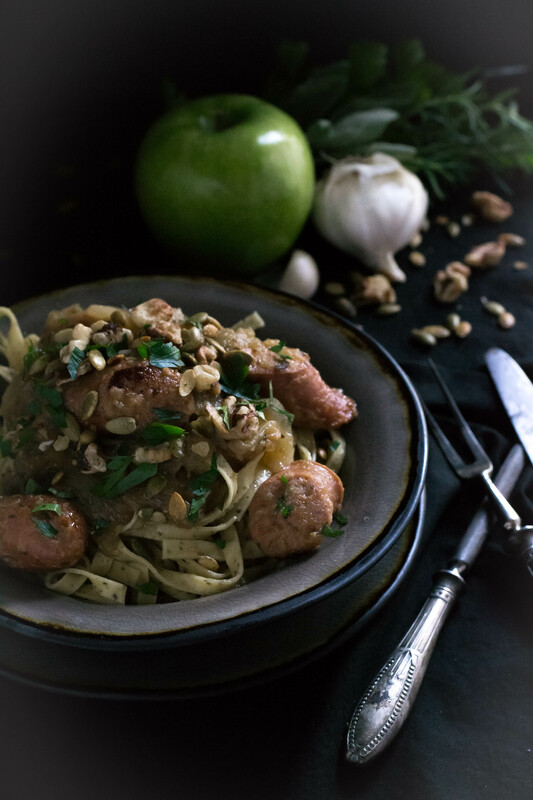 I’ve been on an Instant Pot kick again and used the sear feature…..no matter what brand you buy, be sure you have that feature……to give a quick color to the sausage and onions. Add the rest of the ingredients, sticking with a fall apple theme I added apples, brown sugar, apple cider vinegar, grainy mustard, and some herbs. Figuring just a quick 4-5 minutes of high pressure would be enough, it really only needed to be heated through, and with a natural release I thought the flavors could just come together. Then I opened the Instant Pot……….holy moly……. the apple imploded!!! I was flabbergasted!!! Thinking I was gonna chalk this one up to a food blog fail…….and then the happy little accident. Once I stirred the mixture….we still needed to at least try it right?? Those imploded apples turned into a delicious sauce……..that’s right…. I had sauce!!!! More fall theme…. 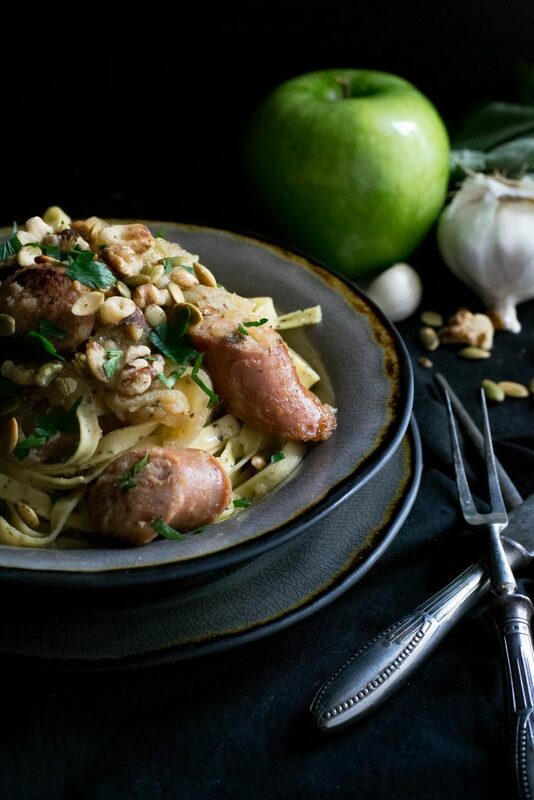 toasted walnuts, pumpkin seeds (pepitas), and a garnish of fresh parsley………now I know why that pasta called to me…..it needed this sauce. 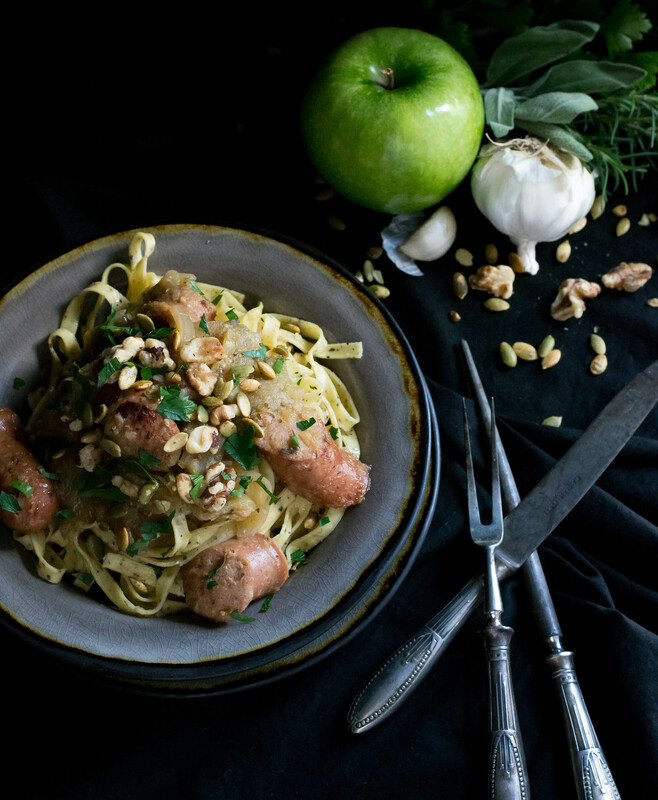 Make your own happy little accident and try our Instant Pot Apple Chicken Sausage. A new fall favorite!! Chopped parsley, toasted walnuts, and pepitas for garnish. Set your Instant Pot to sear. Melt butter and add onion and sausage. Cook stirring frequently until sausage begins to brown. Add sliced apple, and the next 8 ingredients, plus salt and pepper to taste. On high pressure (set according to your machine) cook 4 minutes. Allow pressure to natural release 10 minutes, then quick release any remaining pressure. 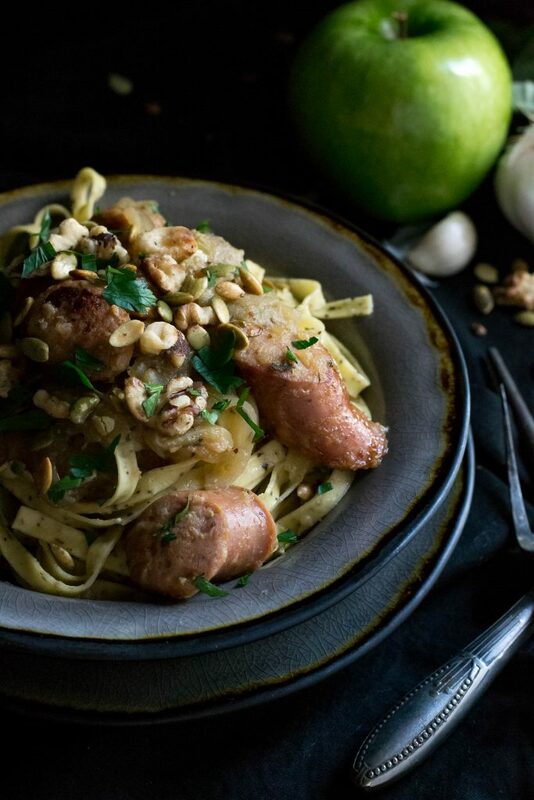 To serve place cooked past in a bowl and top with sausage apple mixture. Garnish with parsley, walnuts, and pepitas. This can easily be done in a skillet, you will need to adjust cooking time to get the apples to create a sauce.